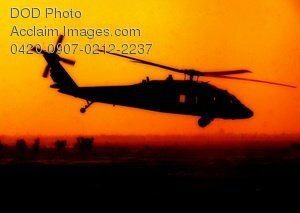 Description: Free, public domain image: Beautiful Sunset Shot of a Black Hawk Helicopter Flying Over Baghdad. A U.S. Army UH-60 Black Hawk helicopter from Charlie Company, 227th Aviation Regiment flies over Baghdad, Iraq, Oct. 9, 2007. (U.S. Army photo by Spc. Jeffery Sandstrum).